I’m happy to learn that Arrangement for a Silent Orchestra was included in the list of top ten Phoenix art exhibits of 2015. I received the news today while sitting in a truck cab parked on a forest road at the foothills of Flagstaff’s San Francisco Peaks. Outside, strong and frigid winds surrounded another pile of instruments: violins, cellos, flutes, clarinets, trombones. A tuba and a French Horn. This is the beginning of the next iteration of Arrangement for a Silent Orchestra. * A battery of cameras on tripods, wrapped in towels and plastic for warmth and protection, record the slightest movement of weather and snow flurries accumulating on the instruments. Winter storm Remus was supposed to bring several inches of precipitation over the Christmas holiday. So far—on Day 3, Christmas Eve—the snow has yet to come. If Santa is still taking requests, I’d appreciate a few inches tonight. At this point, I’ve basically been documenting a mound of instruments shivering in a mountain meadow. 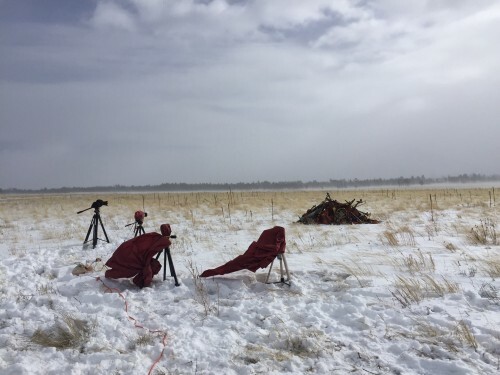 *Originally exhibited under the title Arrangement for a Silent Orchestra, the second phase necessitates a subtitle, hence the designations: 451° F (combustion temperature for wood); and 28° F (temperature for snow accumulation). Such a fan! Sign me up! Arrangement for a Silent Orchestra is traveling. Please help it get there.